If you’ve ever put a lot of work into carving a pumpkin, only to see it shrivel up into a wrinkled mess before you get to set it out for Halloween, you may have realized you haven’t done something right. Take heart, however — there is an art to Jack O’Lantern preservation and it’s not difficult to master. What’s more, you can even enlist your HVAC system to help you keep Jack in fine fettle for the spookiest night of the year. As you’re well aware, the warm temperatures of Orlando that you’re likely to encounter on Halloween may be challenging to Jack O’Lantern preservation. 1. Select a pumpkin without a blemished surface; watch out for dark spots at the top — a sign of frost damage. The pumpkin should feel hard to the touch. 2. Keep the pumpkin indoors until you are ready to carve it, preferably maintaining an indoor temperature between 55-65 degrees Fahrenheit. If you normally keep your thermostat in the low 70s in October, you might want to lower it a bit — particularly if you’ve bought your pumpkin several weeks before Halloween. You can put it in the refrigerator, but don’t let it freeze. 3. Carve your pumpkin at the last possible moment. Clean insides thoroughly of seeds and fibrous material. Scrape the sides. 4. There are several things you can do to preserve your pumpkin after you carve it. Spray the pumpkin with a bleach and water solution to prevent fungus, or squirt lemon juice on the exterior to inhibit browning. You can also apply petroleum jelly or vegetable oil on cut areas to prevent dehydration. Spraying cut surfaces with hairspray may also help. 6. Cut the bottom of the pumpkin out rather than the top so you can set the carved pumpkin on top of the lit candle. 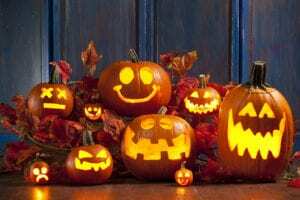 Extra tip: You can also soak your carved pumpkins in water during the day to hydrate, and then set them out in the evening. Want more tips on using the HVAC for Jack O’Lantern preservation? Contact Rinaldi’s Energy Solutions of Orlando.